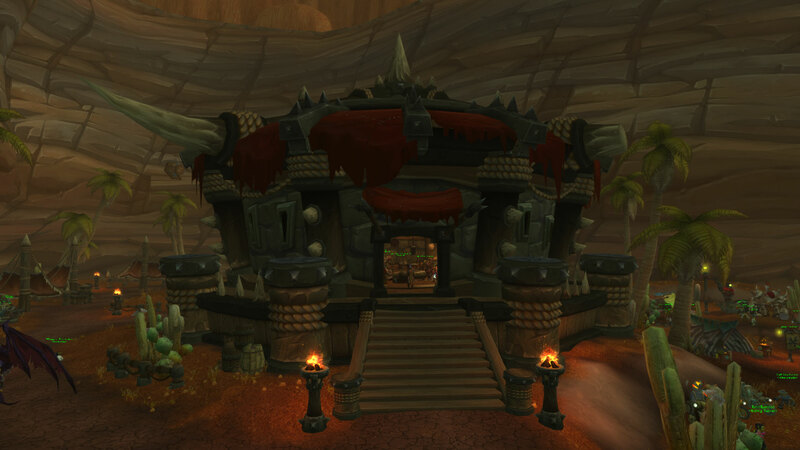 As mentioned by TheRedShirtGuy at BlizzCon, Blizzard Entertainment added the Orgrimmar Embassy at the Goblin Slums (Valley of Spirits), and Stormwind Embassy at the Wollerton Stead (53,15). 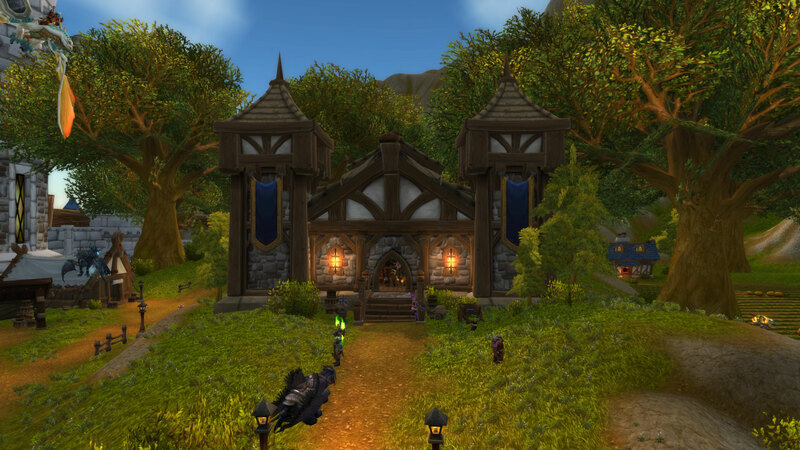 These places feature the gathering of all leaders of both factions. Argus, my home world, holds the soul of a titan. It has been twisted and corrupted beyond redemption, its power harnessed to fuel the Legion’s infinite army. We must do the impossible… breach the depths of Antorus and sever the Legion’s connection to the world soul. Please, (name). End its pain, its suffering. In striking down the dark heart of Argus, we will defeat the Legion… and redeem the soul of my world. Strike down the soul of Argus in Antorus, the Burning Throne. 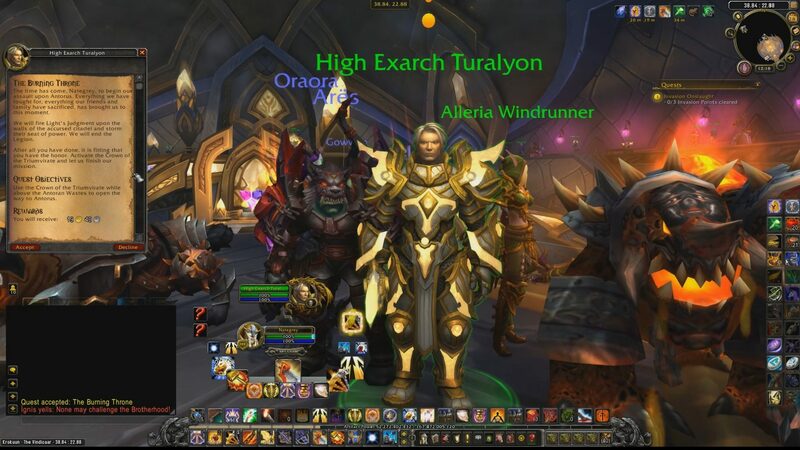 High Exarch Turalyon: The time has come, (name), to begin our assault upon Antorus. Everything we have fought for, everything our friends and family have sacrificed, has brought us to this moment. We will fire Light’s Judgment upon the walls of the accursed citadel and storm their seat of power. We will end the Legion. After all you have done, it is fitting that you have the honor. Activate the Crown of the Triumvirate and let us finish our mission. 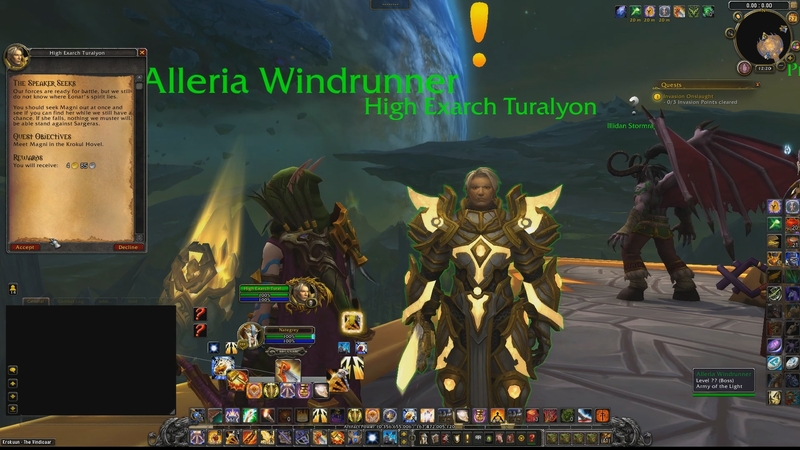 Use the Crown of the Triumvirate while above the Antoran Wastes to open the way to Antorus. 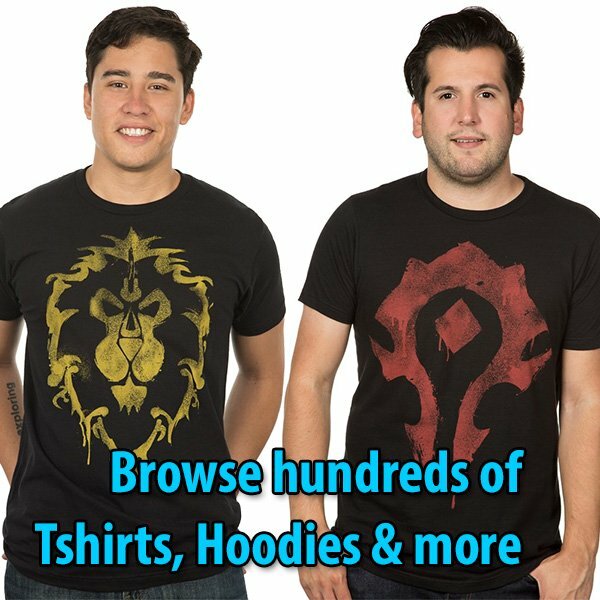 Magni Bronzebeard: Whoever’s tryin’ to reach us now might give us the information we need to find Eonar. We need to see what’s goin’ on right away! 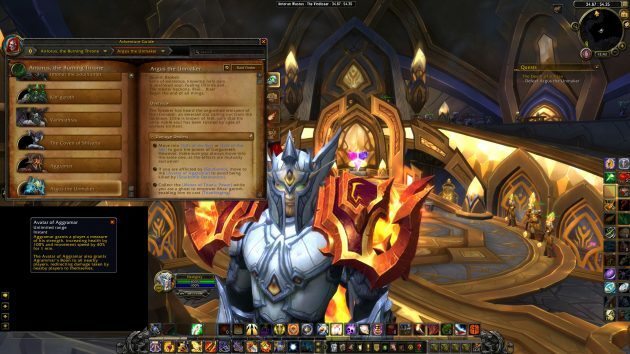 Witness Argus’ vision with Magni. High Exarch Turalyon: Our forces are ready for battle, but we still do not know where Eonar’s spirit lies. You should seek Magni out at once and see if you can find her while we still have a chance. If she falls, nothing we muster will be able to stand against Sargeras. Meet Magni in the Krokul Hovel. 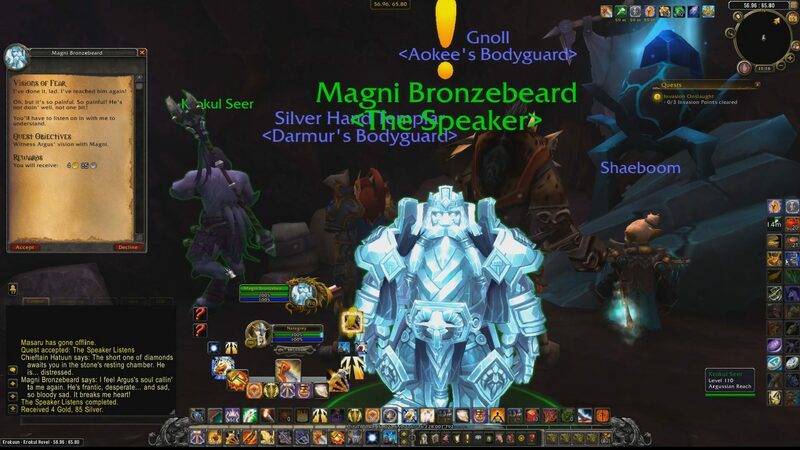 Magni Bronzebeard: I’ve done it, . I’ve reached him again! Oh, but it’s so painful. So painful! He’s not doin’ well, not one bit! You’ll have to listen on in with me to understand. 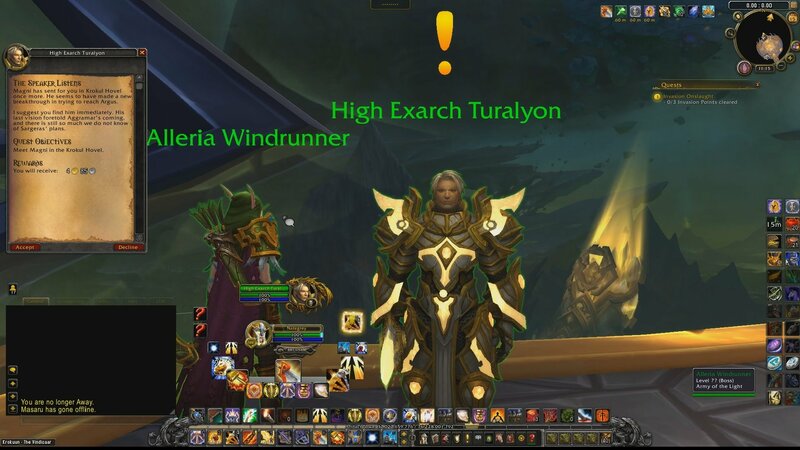 World of Warcraft patch 7.3.2 (25497) introduced two new quests in Argus: The Speaker Listens and Visions of Fear — as the prelude to the Antorus raid. High Exarch Turalyon: Magni has sent for you in Krokul Hovel once more. He seems to have made a new breakthrough in trying to reach Argus. I suggest you find him immediately. His last vision foretold Aggramar’s coming, and there is still so much we do not know of Sargeras’ plans. The Antorus Raid Quest is now available in the PTR. This quest will unlock access to the raid. Currently, the location where you would zone-in into the raid is blocked by rocks. 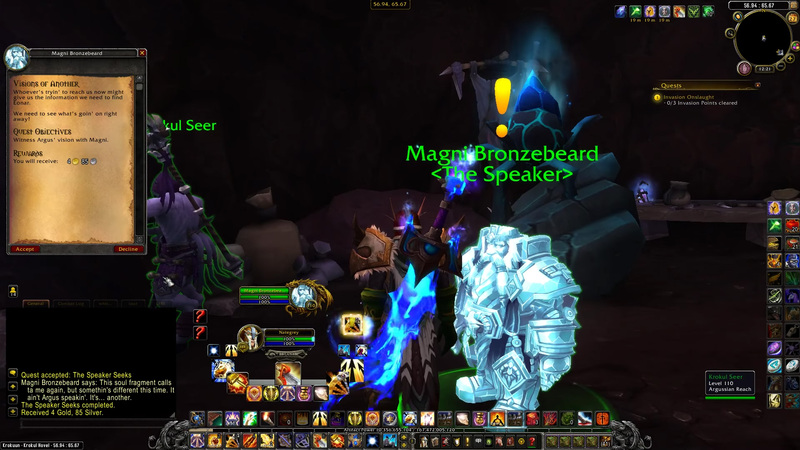 As soon as you accept the quest, a cutscene is unlocked, showing the Vindicaar ship blasting through rocks to open a way into Antorus. The portal becomes visible after this cutscene, allowing players to zone-in into the raid dungeon. 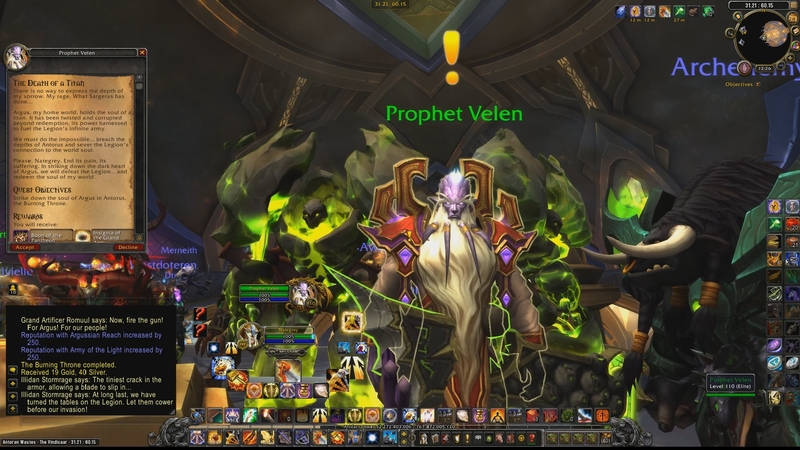 After completing the quest, Velen provides the next quest which requires you to defeat the World-Soul: “The Death of a Titan.” In addition, I checked the Dungeon Journal. The Argus the Unmaker Overview and story is now available in the Dungeon Journal. Read the Spoiler below. Move into Gift of teh Sky or Gift of the Sea to gain the power of Golganneth. However, make sure you always move into the same one, as the effects are mutually exclusive! Constellar Designates equipped with Sword of the Cosmos and Blades of the Eternal should be tanked (Melee Attack damage increased by 300%). Additionally, try to keep the Designate equipped with Sword of the Cosmos away from any other designates to avoid Cosmic Power stacking too high. 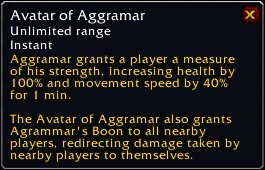 If you are affliected by Soulbomb, move to the Avatar of Aggramar to avoid being killed by Soulburst Detonation. Collect Motes of Titanic Power while you are a ghost to empower Khaz'goroth, enabling him to cast Titanforging. 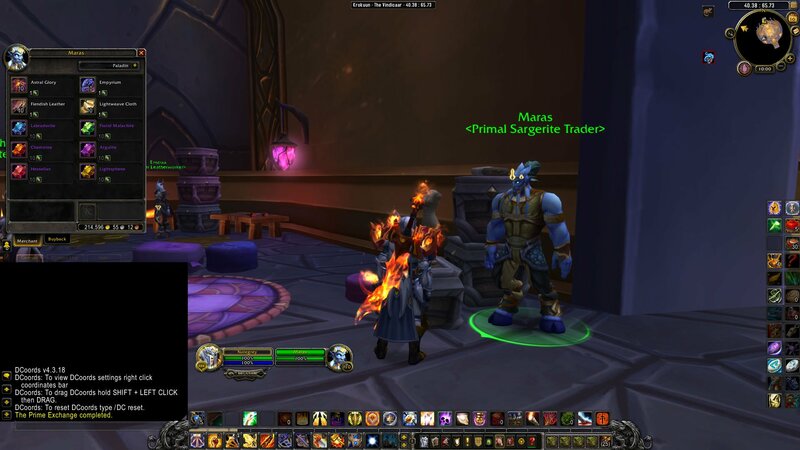 The World of Warcraft PTR 7.3.2 introduces a new Primal Sargerite Trader NPC named Maras located within The Vindicaar in Argus. He stands next to the Master Tailor Khaela. 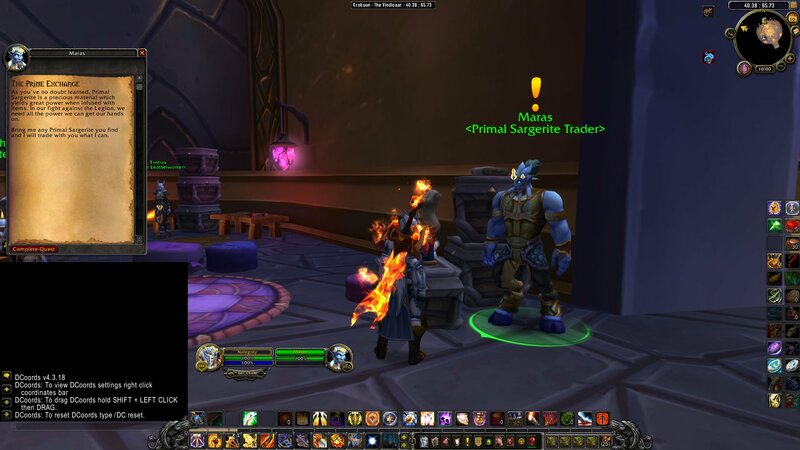 First thing you notice when you login into Patch 7.3.2 is a new quest (seen in the mini-map) by Maras: “The Prime Exchange.” After completing the quest (if you have Sargerite x 1), the trade window is unlocked providing profession materials for Sargerite x 1 or by 10. TIP: Hold the right-button and choose “Open Link in New Tab” for the full-size image.